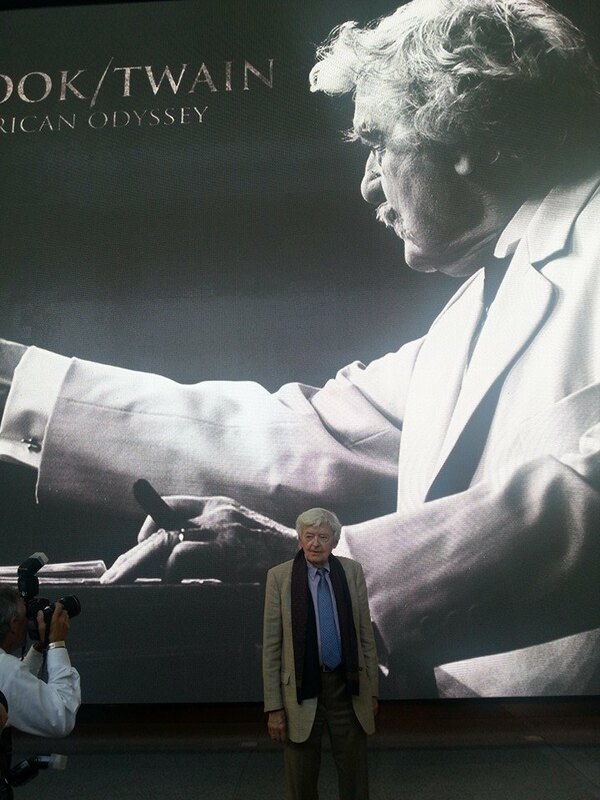 On June 18, 2014 the American Film Institute offered audiences the opportunity to become familiar with the truth when its five-day documentary festival in Washington D.C. opened with an instant classic: Holbrook/Twain: An American Odyssey. With dozens of excellent new documentaries to choose from, the AFI made the right choice in selecting this film to open the festival. The film is intimate, compelling and all-American. And it is honest. Lovingly directed by Scott Teems and produced by Laura D. Smith, the project was a reunion of sorts. Teems directed and Smith produced That Evening Sun, the critically acclaimed award-winning film that starred Hal Holbrook and featured his wife, Dixie Carter. And it was during that film, which would sadly be Dixie's last, that she suggested the concept for a documentary about Hal's many years portraying Mark Twain in his one-man show, Mark Twain Tonight! Dixie had the right idea. This film is much more than the story of Holbrook performing as America's most beloved author. The feature-length documentary, shot in timeless black and white, takes us behind the scenes as Holbrook applies his stage make-up, performs a sound check, and reviews his notes before performing. We see Holbrook's files - a tangible record of his sixty years performing as Mark Twain -- headlines, photos, reviews, articles, advertisements, and newspaper clippings from across the country and around the world. Long after the show has ended, the make-up has been removed, and the audience has gone home to get into their pajamas, likely still contemplating what they witnessed on the stage, Holbrook is making notes about the evening, documenting the crowd's reaction, deciding what worked and what didn't. This aspect of the documentary invites us along as stagehands, fans, and journalists. We become part of the act, and it is intimate. But it is not all. In this film, Holbrook, who will be ninety years old next year, accomplished something Mark Twain intended to do with his autobiography: He tells the truth. Yes, Mark Twain remains America's most acclaimed truth-teller, and Holbrook singes audiences with these truths in a way that would make Mark Twain proud - calling out Congress, lobbyists, hypocrites, warmongers, and religious zealots of every stripe who wield their gospel as a weapon. Seeing Mark Twain Tonight! is a tonic; the humor Holbrook uses to deliver the medicine makes us laugh, but the message itself can really sting. That is what audiences relish in Mark Twain Tonight! In Holbrook/Twain: An America Odyssey, we move beyond Mark Twain to Hal Holbrook as the subject, and the truth-telling is all Hal's. He uses no sandpaper or varnish on himself. Holbrook's candid recollections of his years on the road, the toll it took on his children and relationships, and the universal worry of putting food on the table are intimate and honest. He does not attempt to justify the hardships his career created for loved ones - he simply knew no other way. Those who have read Harold: The Boy Who Became Mark Twain will recall Hal's challenging childhood and perhaps better understand why he didn't possess the rudiments of good parenting. Abandoned by his parents at age two and sent away to boarding school at age seven, Holbrook's concept of family was far from traditional. It wasn't until his marriage to Dixie Carter in 1984 that he would finally learn how a functioning family works, and his gratitude to Dixie for that life-changing gift endures. They were married 26 years when she died in 2010. The film moves seamlessly between past and present -- clips of Holbrook on The Ed Sullivan Show, footage of recent performances, Hal's reminiscences of decades performing as Mark Twain, actors applauding his influence and commitment to the craft, scholars praising his fearless efforts to move beyond entertainment to enlightenment, and family members speaking their own truths about a father they missed. It is a shared memoir, and it is not sugar-coated. This documentary will make its rounds of the film festivals before being publicly released. It is the one to watch for, and it will be the one to share. Hal Holbrook manages to flourish -- not just survive -- through adversity. Scott Teems and Laura Smith recognized the importance of this unique story of one American legend portraying another, often at great personal sacrifice. Their film, which has the feel of that proverbial 'labor of love,' spans all human emotions and values. These two men - Samuel Langhorne Clemens (Mark Twain) and Harold Rowe Holbrook, Jr. - share some important similarities: working on the road away from family, losing their beloved wives after decades of happy marriages, and a fascination with truth and the haphazard applications of justice. Mark and Hal often speak with one voice, and it's not simply acting. Mark Twain said, "It is curious -- curious that physical courage should be so common in the world, and moral courage so rare." Hal Holbrook has even performed this line as Mark Twain. This film reveals that rare glimpse of moral courage -- Hal Holbrook's moral courage -- to face and speak the truth no matter how painful.